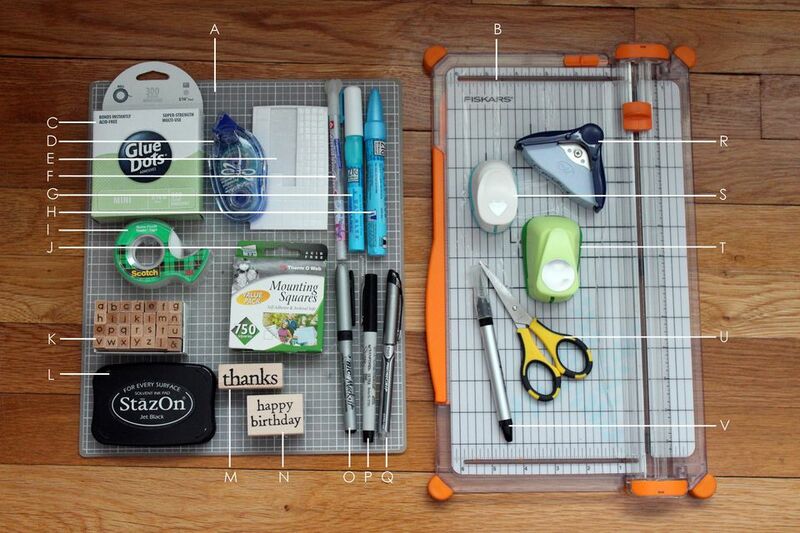 These are tools that you'll use constantly while card making. They are a good investment for anyone considering card making as a hobby. There are different versions of the specific items may be things you already have around the house. Scrapbookers may also have many of these items on hand as card making often can be a byproduct of scrapbooking. A. Self-healing mat: This is a great work surface for several reasons. It protects the table surface from things such as ink stains and knife cuts, while also providing a portable space to work on that scraps or embellishments for specific projects can stay on top of when it comes to clean up. A self-healing mat that also has grid lines in 1/4-inch increments is highly recommended to assist with component placement on projects. They are available in all different sizes so find one that comfortably fits your workspace. B. Paper trimmer: There are various types of paper trimmers in a variety of sizes available (rotary blade, guillotine, sliding blade, etc). A larger trimmer that can accommodate and cut a 12-inch piece of paper is ideal. Many scrapbook papers (patterned and cardstock) come in 12-by-12-inch sizes, and the larger size can be useful when creating card bases. People find different paper trimmer styles easier to use than others so try experimenting with different styles to find one that you are most comfortable with. There are several types of adhesives available depending on what you need to glue down. Here are some that are commonly used in card making. C. Glue dots: These come in various sizes. The mini dots (3/16-inch diameter) are the most useful for smaller projects. Glue dots are ideal for adhering embellishments such as ribbon, paper piecing components, thin metal charms, and other things where liquid glue would not be ideal. Glue dots can be rolled up with your fingertips into a thin cylinder and shaped around a curve. They are also ideal when adhering a thicker or heavier piece of cardstock to a project. D. Roller adhesive: These come with temporary or permanent adhesive and have replaceable refill cartridges. They create a clear line of adhesive and are ideal for adhering paper and thin ribbon to other paper surfaces. E. Foam squares: These can add a bit of dimension to card projects by allowing components to "pop" off the card base. The element will be raised off the surface that it is adhered to. They are ideal for highlighting a specific element on a card such as a raised frame or the sentiment. F, G, H. Glue pens: Liquid adhesive pens are ideal for adhering embellishments such as glitter or sequins, or die-cut paper pieces. The specific products listed below are two-way glues that can be used for permanent or temporary placement (they go on blue but dry clear). The Sakura quickie glue pen is ideal for applying glitter to a hand-written or hand-drawn design because it is comfortably held like a regular pen. It has a fine point that applies glue in a smooth line. The Squeeze and Roll glue pen also has a thin point but is ideal for applying small amounts of glue onto things like die cuts or thin (narrow) areas of the paper. It can also be used for applying glitter in slightly larger amounts than the quickie glue pen because it applies a larger amount when squeezed. The Chisel Tip glue pen is ideal for applying a larger amount of glue onto paper embellishments. I. Scotch tape: Good to have on hand to adhere or secure elements on the back side of a card or piece of paper. Embellishments such as splayed brad legs, the end of embroidery floss tails, or overlapping ribbon pieces are examples of things Scotch tape could be used to secure. J. Photo squares: These are commonly used in scrapbooking and are ideal for adhering larger pieces of paper or cardstock. They can be used when a roller adhesive might apply more adhesive than necessary. For example, apply one photo square in each corner of a rectangular piece of paper instead of applying a line of adhesive on all four edges. Stamps are an easy way to apply a sentiment to cards. With a couple of basic stamps, you can cover a variety of occasions in card making. K. Alphabet stamps: There are alphabet stamp sets available in all sorts of fonts and sizes. A small and simple font can be used to decorate both the outer and inner parts of a card. Alphabet stamps also make it possible to personalize a card with the recipient's name or a custom greeting. L. Permanent ink pad: There are several types of ink pads in a huge range of colors but this one is a go-to ink pad for card making. It's ideal if you also plan to use things such as markers to color in your stamped images as it won't run or fade. M. Thank you stamp: This is great to have on hand for creating quick thank you cards. A nice gift idea would be to create a set of thank you cards that someone could use. N. Happy Birthday stamp: This is another great basic stamp to have on hand for card making because everyone has a birthday. O, P, Q. Markers and pens: Keep these three markers and pens on hand all the time. The ultra fine-point markers are ideal for doodling or handwriting a sentiment. The permanent ink makes them ideal for using with coloring markers as they won't fade or smear. The ball stick pen glides smoothly and is ideal for small details or handwriting a sentiment or greeting on cards. R. Corner rounder tool: If you like the look of rounded corners, this is a great tool to have on hand. It can help soften the lines of a card design. S. Small heart punch: This is an easy way to apply a little embellishment onto a card because you can punch a heart out of anything from patterned paper, scrap paper, or even recycled materials like product packaging. T. One-inch circle punch: Another easy way to apply a little embellishment to a card or to create a small window on a card front. U. Small scissors: These are handy for cutting small embellishments such as ribbon and embroidery floss. They are also handy for trimming excess paper along edges. V. Exacto knife: These are handy for cutting out the paper where scissors cannot be used. Two things that are not listed here are a bone folding tool and a scoring board. Purchase them if you plan to create your own card bases or will do a lot of paper folding.